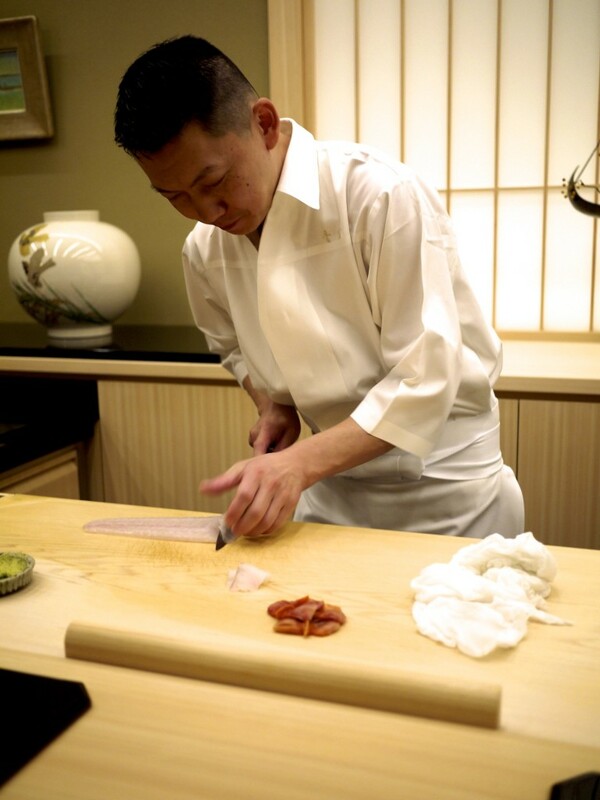 Harutaka Takahashi started off his sushi apprenticeship in Hokkaido in Sapporo before training under the renown Ono Jiro at Sukiyabashi Jiro for thirteen years. 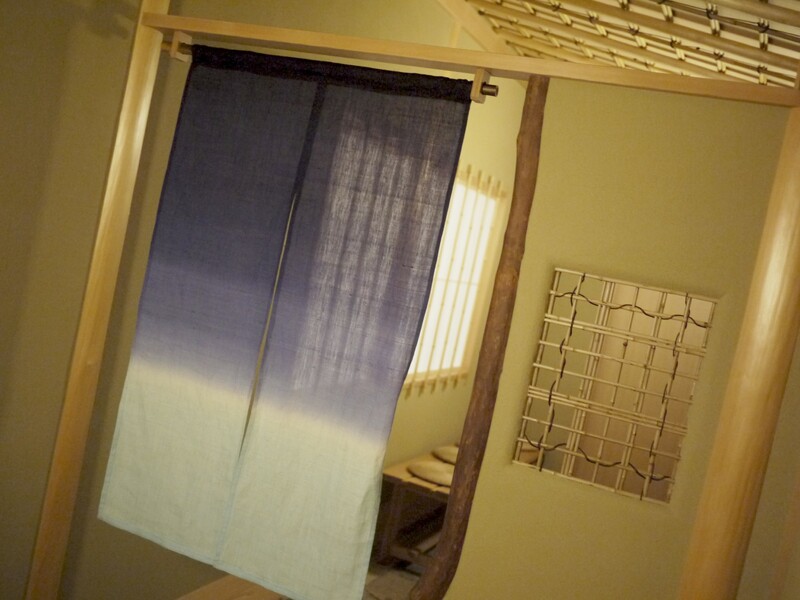 After being entrusted as the third chef in command (after Jiro’s two sons Yoshikazu and Takashi), he went solo to open up his sushiya, Harutaka, in December 2006. The location he chose was Ginza and unlike many other restaurants in Japan, this restaurant was quite easy to find. I wasn’t personally sure as to what to expect from this meal. On the one hand the reviews from Japanese bloggers were consistently positive across tabelog and personal websites, and regulars often spotted dining at the restaurant were chefs with two and three stars themselves. However, on the other hand he appears to have gained and lost Michelin stars over the years. He had two stars in 2011 before subsequently disappearing from the red book, only to make his way back in 2017 with one star. 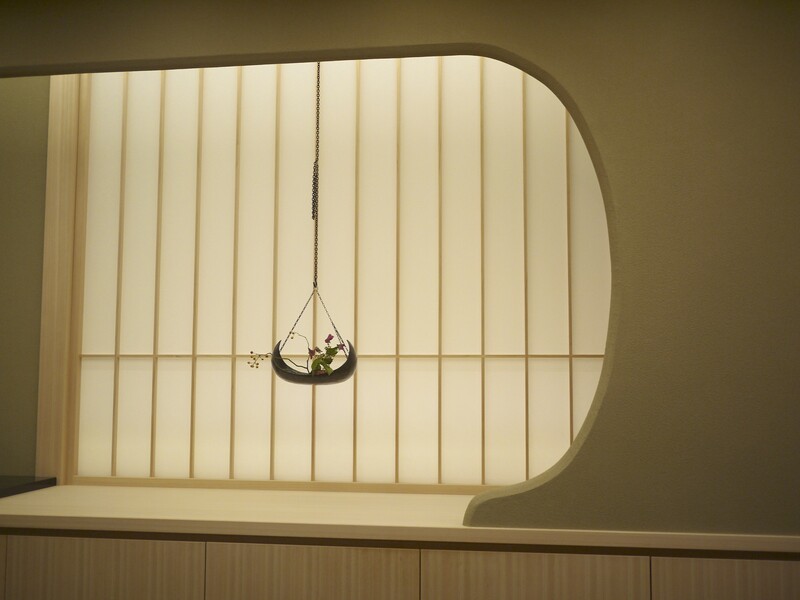 Harutaka occupies the entire third floor of the building and offers 12 counter seating and 1 private room for an additional 4 people. The restaurant is only open in the evenings and serves a standard omakase menu at approximately 30,000 yen. Unlike his mentor, his menu offers other otsumami (snacks) and comes with less attitude. Contrary to the experience I had endured the night before at Shimizu, the environment here was more relaxed. Chef Harutaka even offered an English sushi dictionary to my wife who was the only foreigner dining that evening, which was kindly received. 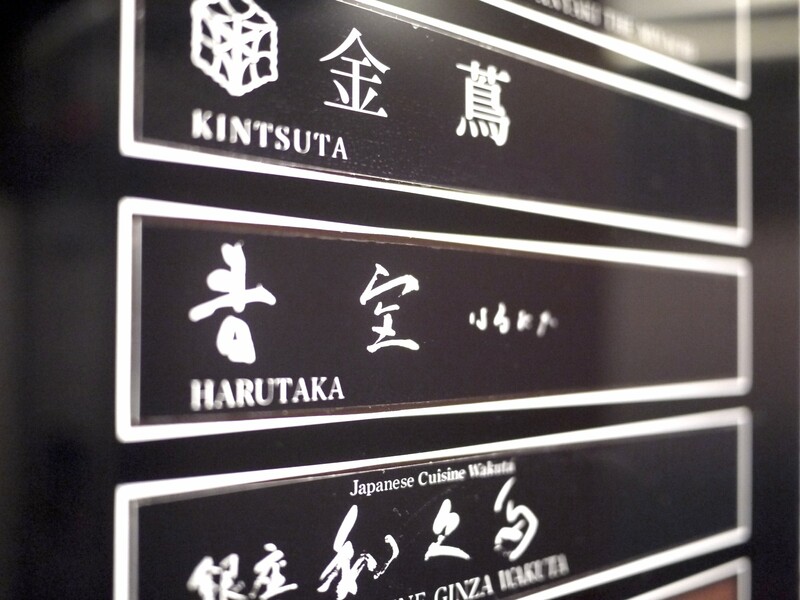 Harutaka is well known for his use of rice vinegar in his shari (rice) and superior quality of neta (topping). Whilst foreigners appear to have a more divided opinion on his sushi, the locals overwhelmingly rate positively the way in which he prepares his shari. There’s a slight sharpness from the vinegar, followed by a slight saltiness, finishing with the natural sweetness of the rice. The chef quickly gave us a heads up that we would be getting a variety of otsumami before sushi, and just like that we were off. 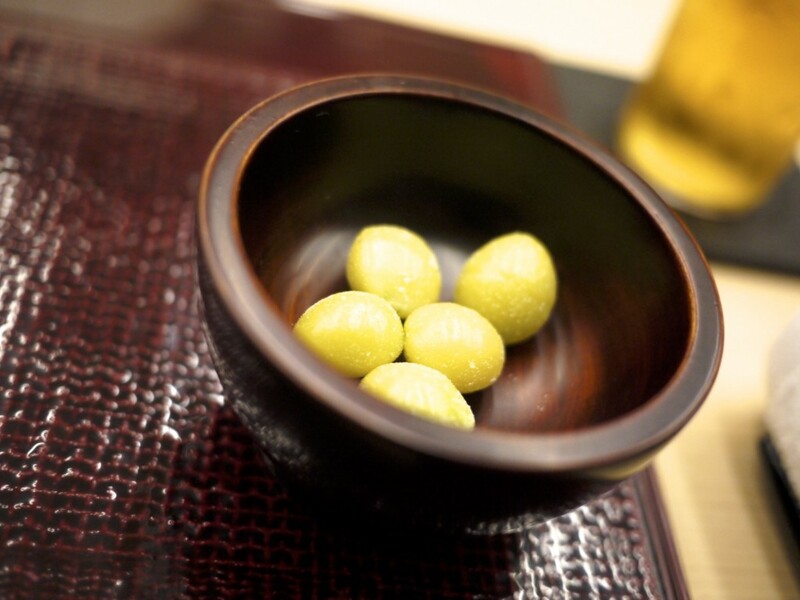 Appetiser – Gingko (銀杏) served slightly warm and sprinkled with salt. Certainly whet our appetite. 1st course – Japanese Tiger Prawns (kurumaebi) with Japanese radish (daikon) and ponzu. The sweet tiger prawns from Kyushu were served raw in a sashimi style and married well with the daikon and slightly sharp ponzu. 2nd Course – Pacific Saury / Sanma (サンマ). Slightly grilled with salt creating a lovely contrast of the crispy skin and the soft flesh of the fish. 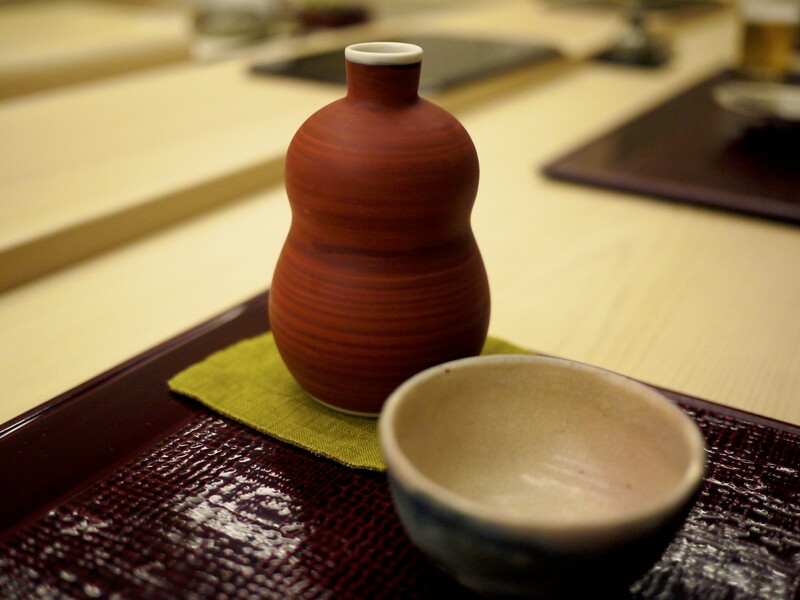 Sake – Yoemon – Junmai. A perfect timing for the arrival of my sake for the evening. It went down really well with my grilled fish at a modest price of only 3,000 yen per tokkuri. 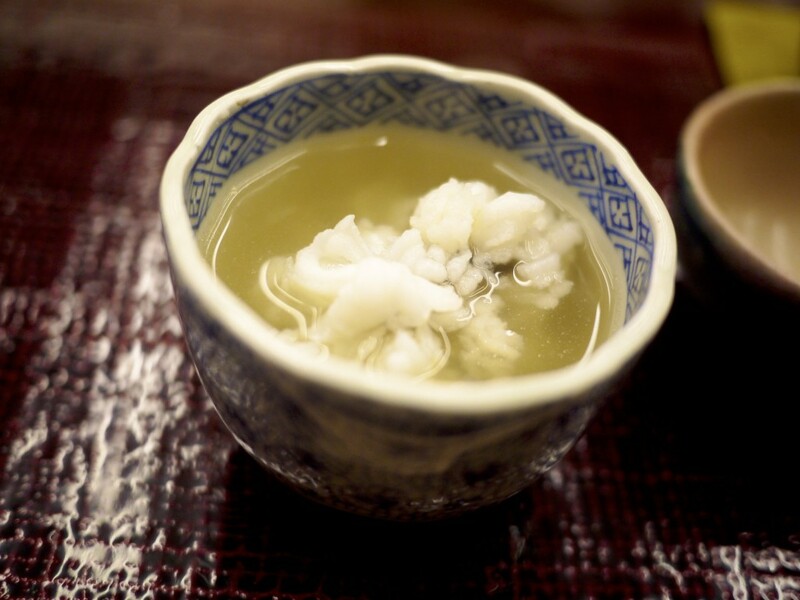 3rd Course – Conger pike (Hamo) with matsutake broth. The umami from the dashi used for the broth was superb and really worked well by drawing out the flavour of the delicate conger pike. There was also a slight hint of plum and vinegar which complemented the fish. 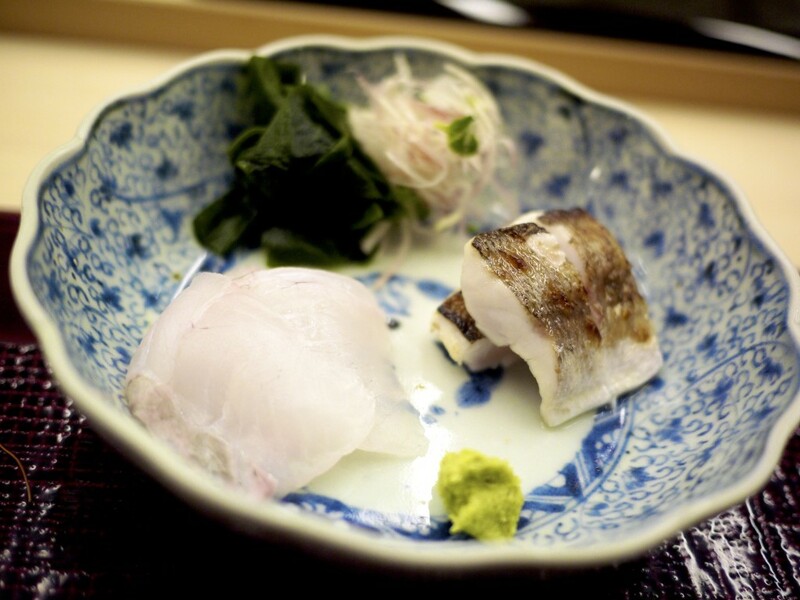 4th Course – Sashimi of Flounder / Hirame (平目) and slightly grilled barracuda / kamasu (梭子魚). A great combination of flavours between the sweetness of the flounder which becomes very fatty during autumn contrasted with the strong flavour the lean barracuda. 5th Course – Steamed abalone / mushiawabi (蒸し鮑) scorched with soy sauce. 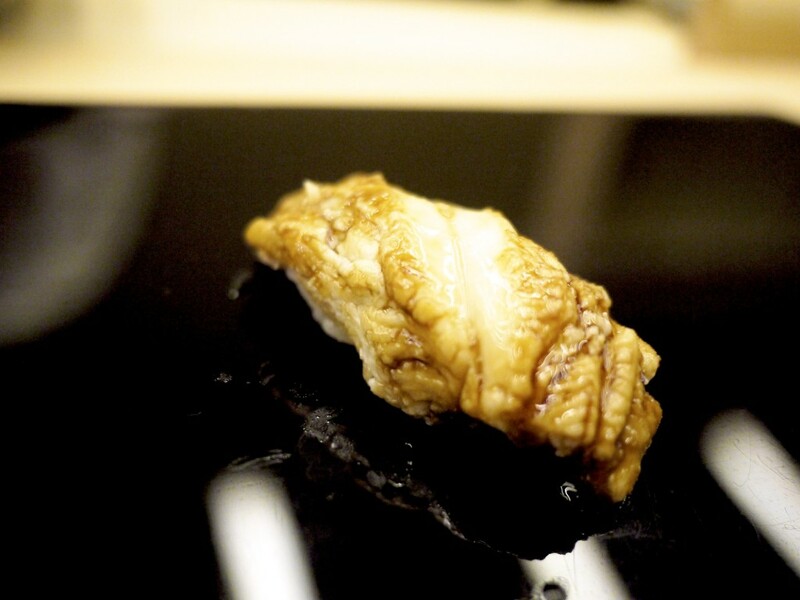 The abalone was steamed for 3.5 hours in sake before being sliced and scorched with soy sauce. It was perfect in every way with its scent, umami and crispiness. By far and beyond the best abalone my wife has ever had. 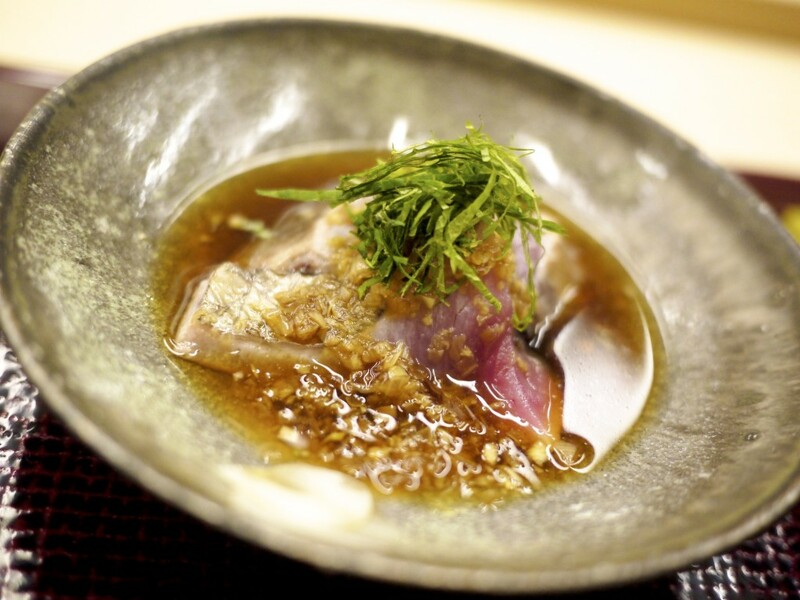 6th Course – Skipjack / Katsuo (鰹) with ginger soy sauce. This was our favourite course of the otsumami. There was a slight smokiness to the fish from the way in which he scorched it before dressing it with the ginger soy sauce. 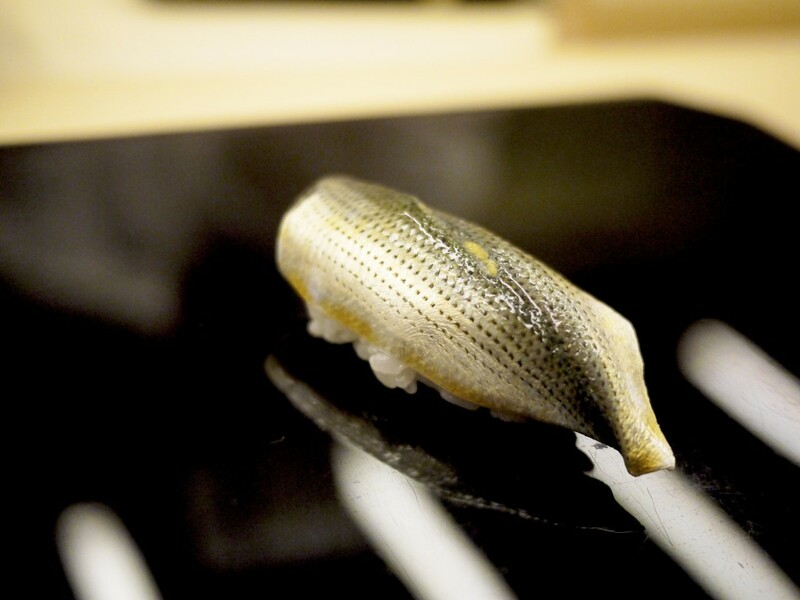 7th Course – Willow leaf fish / Shishamo (柳葉魚) sourced from Hokkaido. The flesh here was far more delicate and the flavours more subtle than others I have tasted before. Unlike the normal ones I’m use to at the typical izakayas, this one was completely absent of any bitter aftertaste. 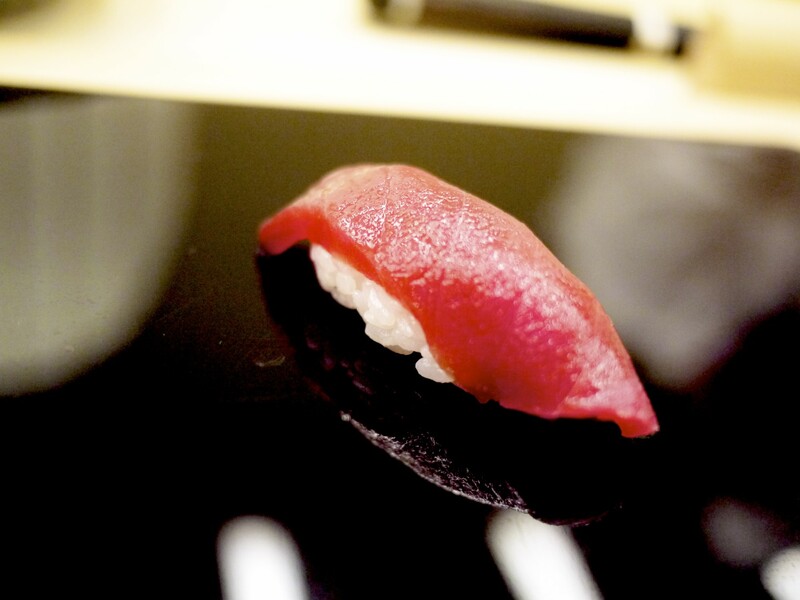 We looked over to see the chef preparing for the private dining room’s next few nigiris who were far ahead of us. The quality of the tuna looked very good. 8th Course – Squid / Sumi ika (スミイカ). Our first sushi was a silky and tender ink squid. Absent of any rubbery texture, this was as good as squid goes. 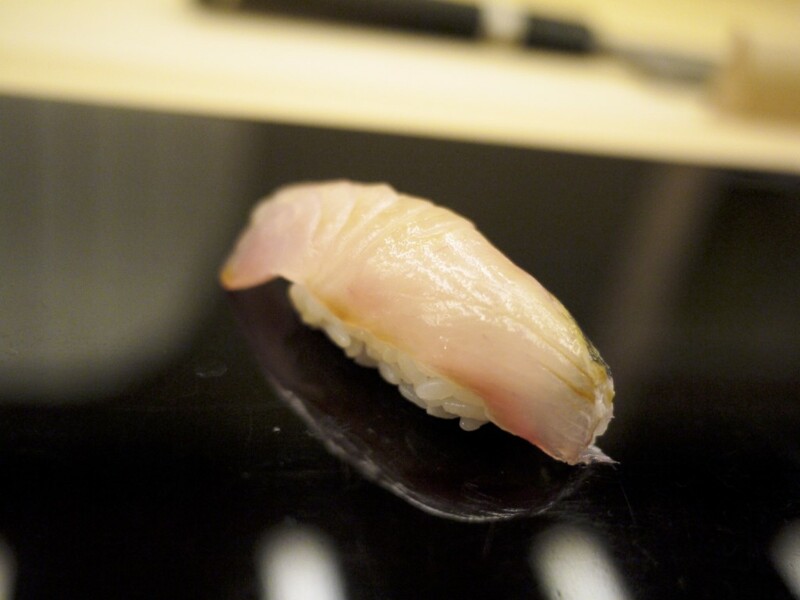 9th Course – Striped Jack / Shima aji (縞鯵). An impressive sushi with an incredible sweetness and fattiness from the slightly pickled fish competing with the slightly sharp shari. 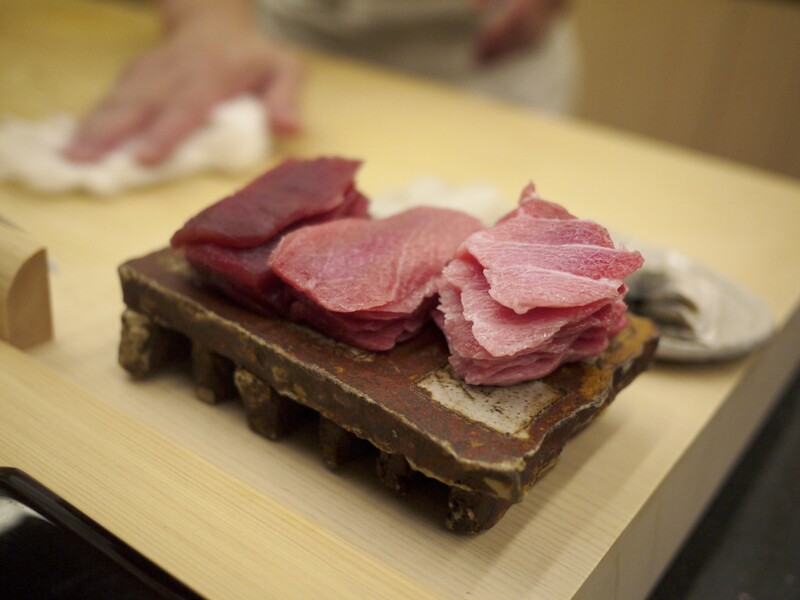 10th Course – Lean part of the Tuna / Akami (鮪赤身). The shari actually worked best here with the tuna. Attention to detail here was important and my wife’s tea was changed just before the akami was served (it is common practice to change the tea when tuna is served to cleanse your palate between the tuna courses and bring the temperature of the tea up again). 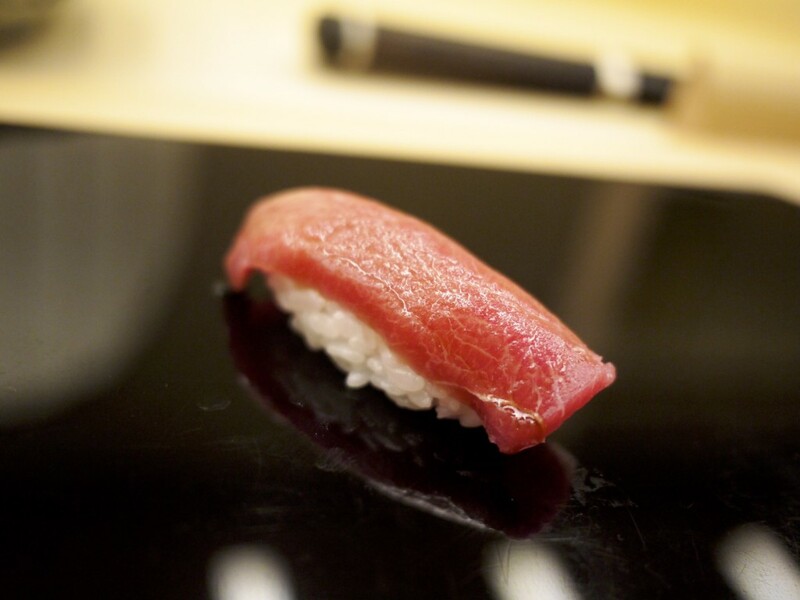 11th Course – Medium fatty tuna / Chuutoro (鮪中トロ). An absolute masterpiece of nigiri. The sweetness and fattiness of the tuna penetrated right through the sharp and salty shari. A match made in heaven with no lingering fatty aftertaste. This was probably the best chuutoro I’ve ever had. 12th Course – Fatty Tuna / ootoro (鮪大トロ). A lovely cut of tuna but personally I felt the combination of the medium fatty tuna and the shari was superior. Each to their own I guess! It did however allow us to appreciate the different textures and flavours of the whole fish. 13th Course – Gizzard shad / Kohada (小鰭). 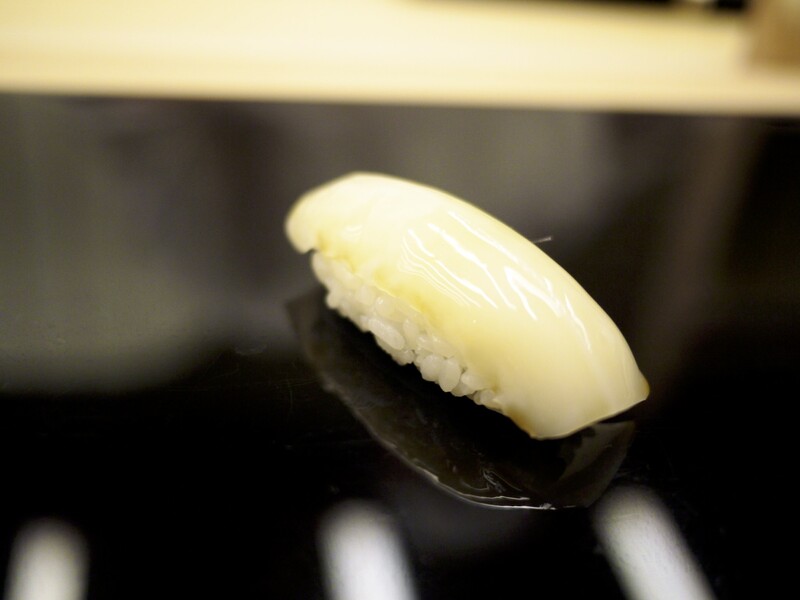 This nigiri required a labour of love in order to remove the distinct smell, leaving only a peasant oiliness and sweetness behind. 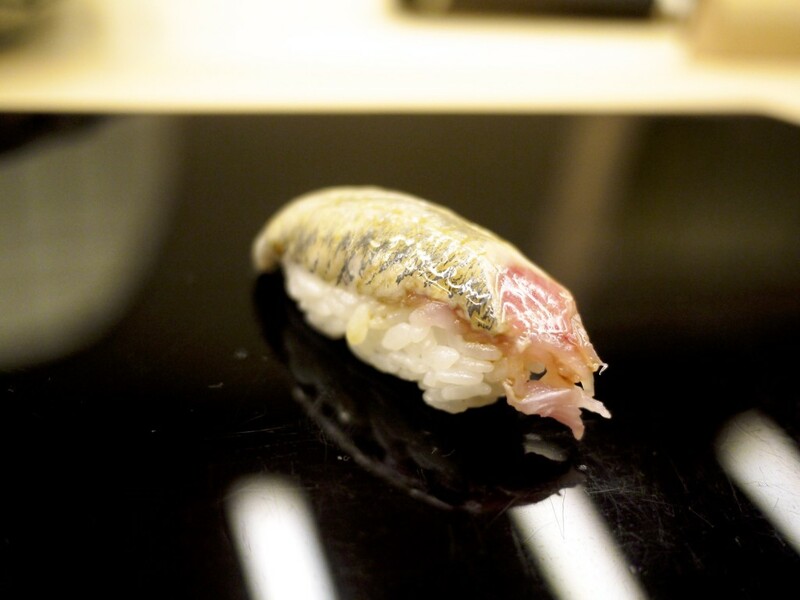 The fish was sourced from Amakusa in Kumamoto prefecture. I was pleasantly surprised with the quality given the best season to fish is normally November / December, and we were a month early. 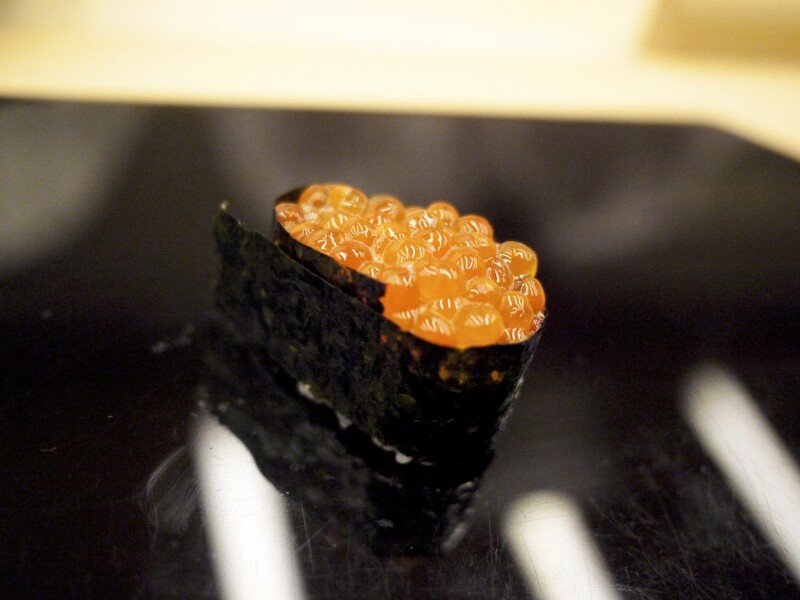 14th Course – Salmon Roe / Ikura (イクラ). An all time favourite of mine since I was a kid and this certainly didn’t disappoint. The salmon roe was slightly pickled in soy sauce to enhance the flavour. Each pearl burst with a gooey delicious salty juice. 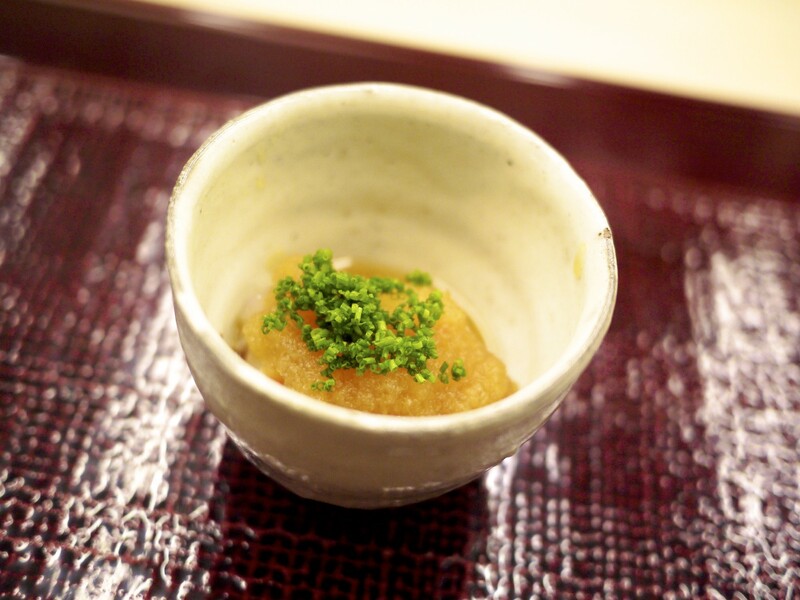 15th Course – Japanese Pilchard / Iwashi (いわし). This nigiri was my personal favourite of the evening. The umami was incredible and it just melted in your mouth with little effort like a slice of the finest iberico ham. The slight bit of ginger underneath cut through oiliness of the fish. 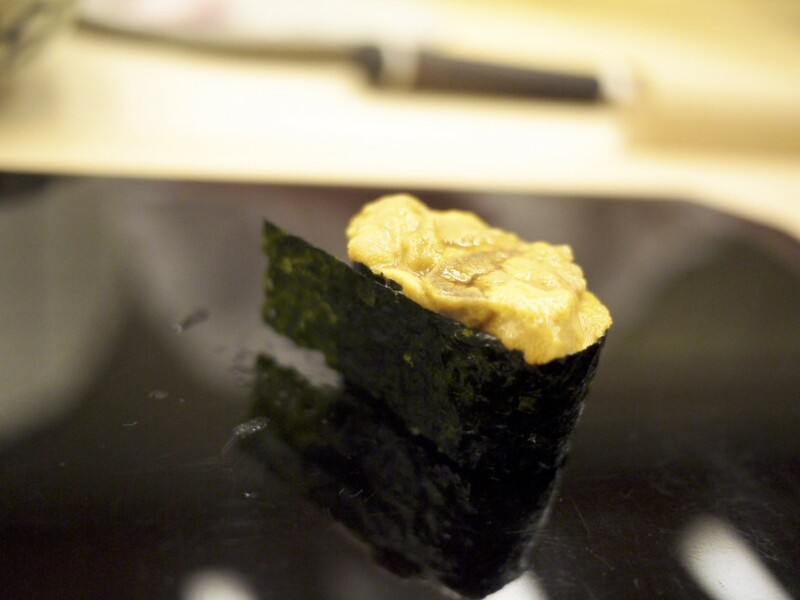 16th Course – Sea urchin / Uni (雲丹). 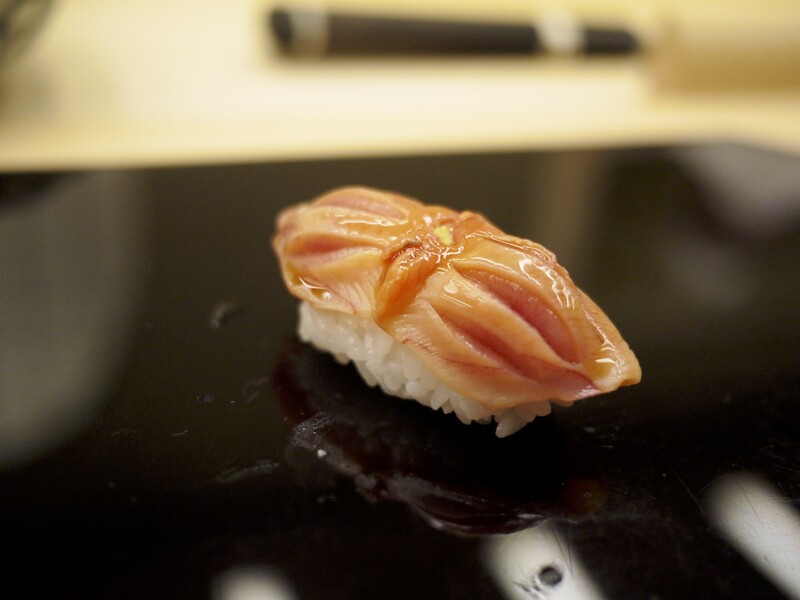 A classic nigiri which required very little interference. Sourced from Hokkaido again, this was a beautifully sweet, creamy and absent of any bitter aftertaste. 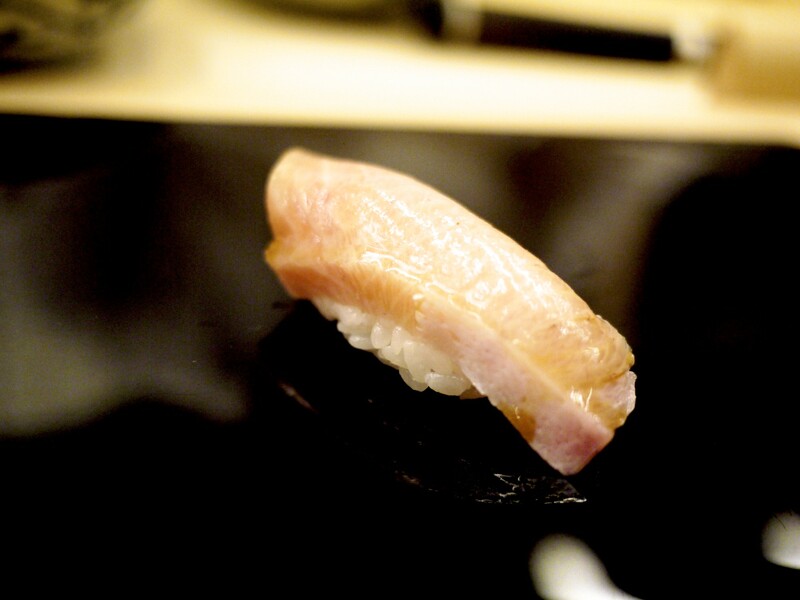 17th Course – Amberjack / Buri (鰤). 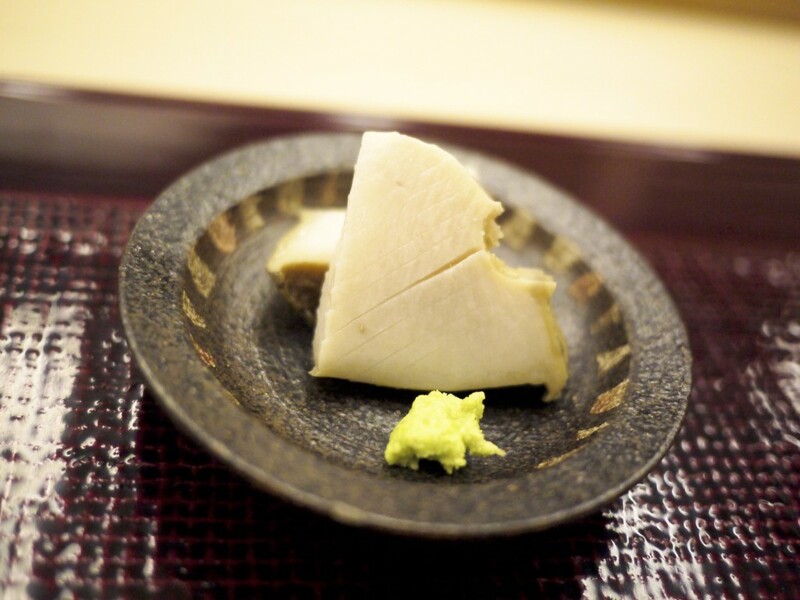 Sourced from Himi at Toyama prefecture, home to one of the best amberjack in Japan. I did however find that the vinegar rice and the fish on this occasion wasn’t quite the perfect match, although the quality and preparation of the fish was second to none. Chef Harutaka spoke very little English but was happy to answer any question I translated for my wife. Whilst he was very focused in his job, meticulously preparing each nigiri, we couldn’t help but notice that he looked like he was having fun. Perhaps it was the cheerful crowd of three sitting at the other end of the counter (they appear to have been celebrities), but he certainly did not stop smiling all evening. 18th Course – Red clam / Akagai (赤貝). 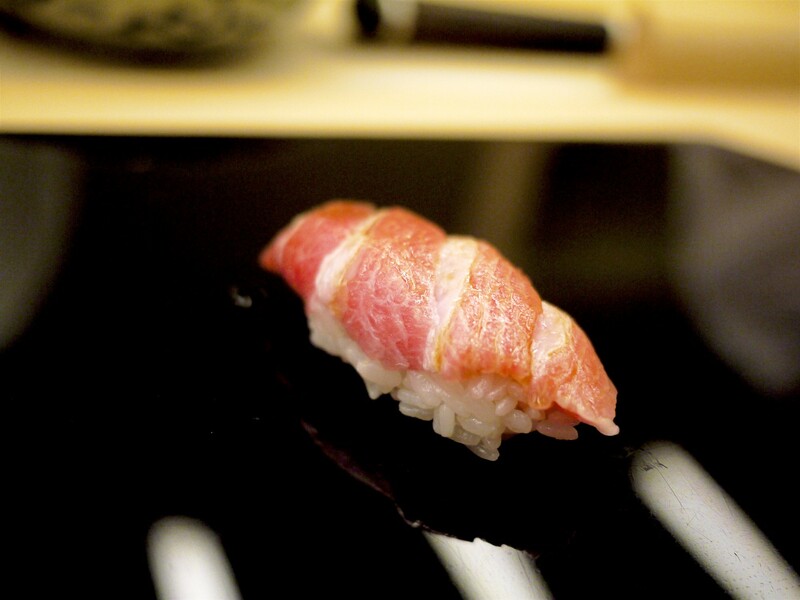 Again the quality of the superior red clam could be tasted here even before you ate the nigiri. The olfactory senses were teased before the tastebuds picked up the natural sweetness of the clam as soon as it landed on our tongue. Sensational. 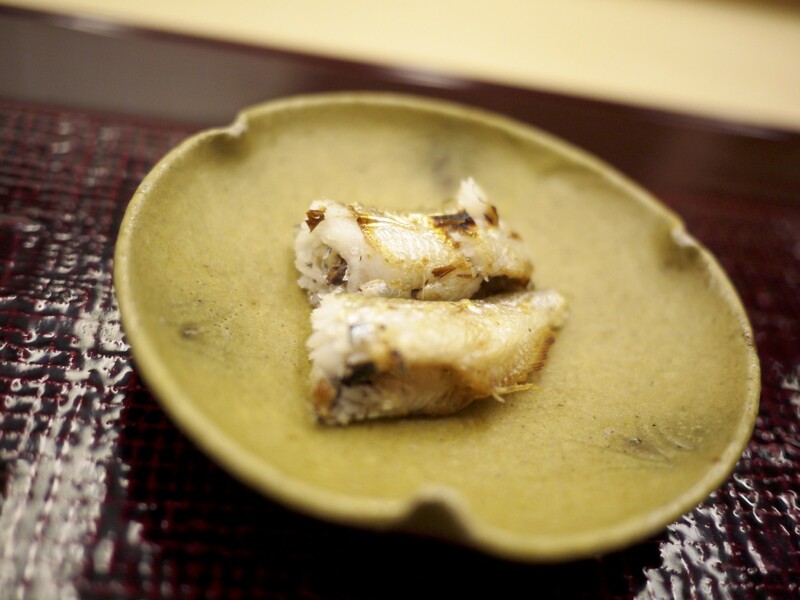 19th Course – Salt water eel / Anago (穴子). A lovely finale to our sushi segment which also brought a sense of disappointment that this was over all too quickly (mind you we were there for 2.5 hours). 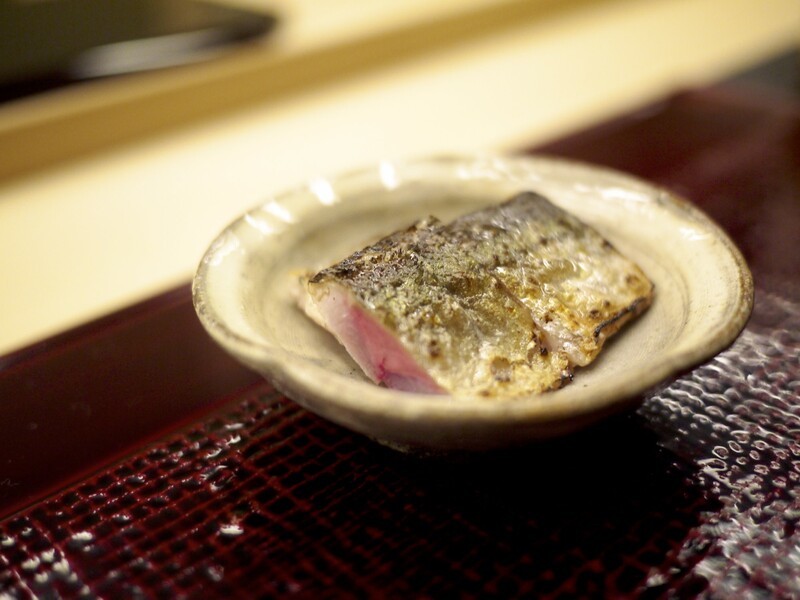 The eel was delicate in its soft texture, yet packed with enough flavour to balance well against the shari. 20th Course – Sweet egg omelette / Tamago (玉子). The omelette here was of the the finest quality one could get, utilising grey prawns (shiba ebi) and mountain potato (yamatoimo). It was very airy inside yet also had a firmness and held a lot of moisture. 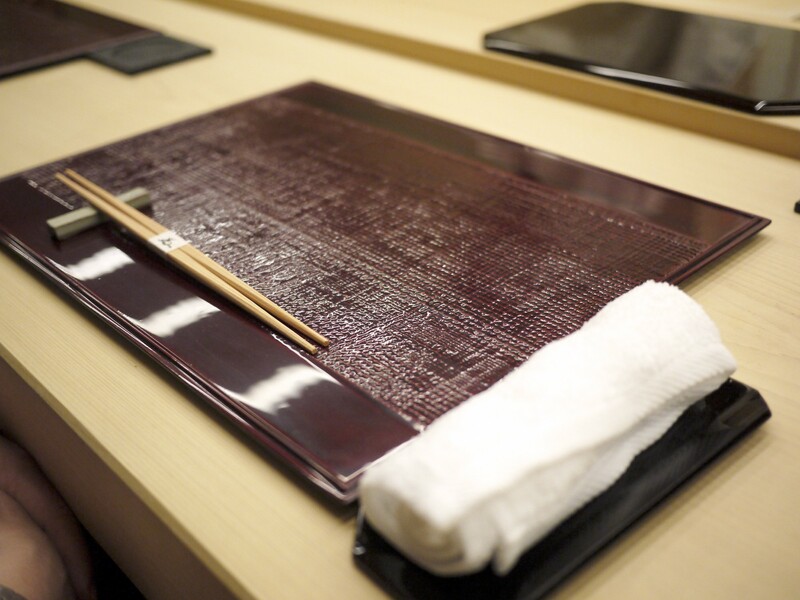 They say that one must have trained for over ten years before being able to serve an omelette at Sukiyabashi. 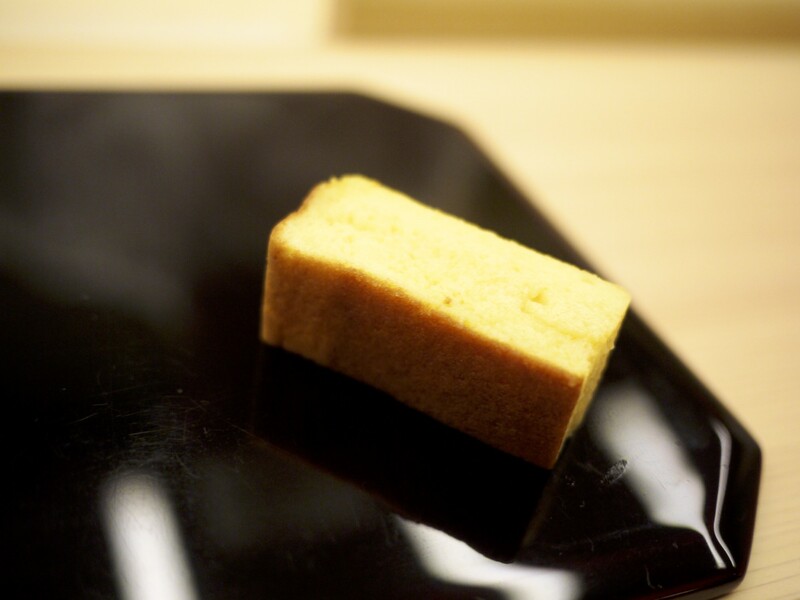 You could certainly see the skill that went into making this tamago. All in all the meal came to about 33,000 yen per person including the sake and a beer at the start which isn’t cheap yet certainly worth every yen when you consider the calibre of the food here. When I raised the question about the red book, the chef shrugged his shoulders as if he really couldn’t care too much. When you looked around the room you could see why. Every single diner here, other than us, appeared to be a regular and the chef knew each person’s likes and dislike. In an intimate environment like a proper sushi-ya, the regular custom is far more important than attracting new diners from afar. Whilst it makes getting reservations even more difficult for people living overseas like myself, I do hope this tradition does not disappear. It’s comforting to see that bond between a diner and a chef. This entry was posted in Japan and tagged Edomae, ginza, Harutaka, Japan, sukiyabashi, Sushi, Tokyo on April 17, 2017 by admin.